Economical and environmentally friendly, the IWM P100 machine used in this project is ideally suited for use in plants where quick and repeatable washes are needed. Water and detergent are re-circulated from a heated tank to ensure cost-effective operation of the sustained jet washing system used to clean the pallets, ensuring that operational costs are kept to a minimum. Achieving high cleanliness and hygiene standards was of paramount importance because the plant produces food-grade salt alongside industrial types. Schweizer Rheinsalinen approached Stussi Industrieanlagen, a leading integrator of conveyor systems, to help them implement the required system. Stussi Industrieanlagen had no hesitation in recommending IWM’s pallet washers for removing dirt, debris and product spillages that find their way onto the pallets during transportation. The IWM P100 is designed to for single person operation with manual loading of the pallets. After the pallets are loaded vertically, they are cleaned using high power jets that offers enhanced washing performance that is particularly useful when dealing with heavily soiled pallets. After the pallets are washed thoroughly, an automated 90° transfer section places them horizontally onto the return conveyor. A high-pressure blower module removes the remaining residual bulk water and provides partial drying. This helps to eliminate bottlenecks, as pallets are dried quickly and ready to be used again almost immediately. At the end of the wash/dry cycle, the clean pallet is available on the exit-end rollers for removal by the operator. An important requirement for the system was that it should include provision for future expansion of the machine to allow for increases in production. To meet this requirement, the P100 is configured so that an automatic pallet stacker unit can to be retrofitted at the exit end of the unload station. This will allow the operator to remove a stack of up to 15 pallets using a fork or pallet truck. The design also allows for a secondary heated blower module to be fitted to deliver fully dried pallets that are ready for instant re-use. 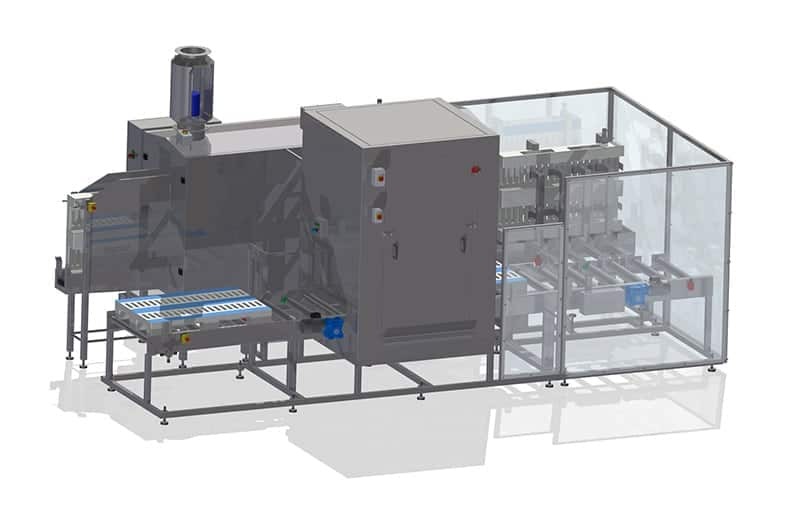 Designed to integrate easily and efficiently with plant operations of all types, the IWM P100 washer is the “salt of the earth” for industrial environments requiring quick, repeatable, accurate and cost-conscious pallet cleaning functions.